Remembering the fallen WW1 servicemen of the following English communities: St. Helen's Auckland, West Auckland, Etherley, Evenwood, Cockfield, Butterknowle, Copley and Woodland. 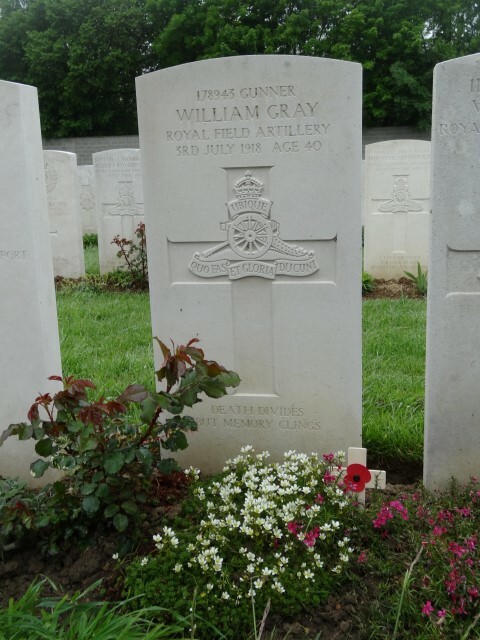 178943 Gunner William Gray, 52nd Battery, 15th Brigade, Royal Field Artillery died of wounds 3 July 1918 and is buried at Terlincthun British Cemetery, Wimille, France. He was about 40 years old and is commemorated on the Evenwood War Memorial and the memorials in St. Paul’s Church and the Workmens’ Club. 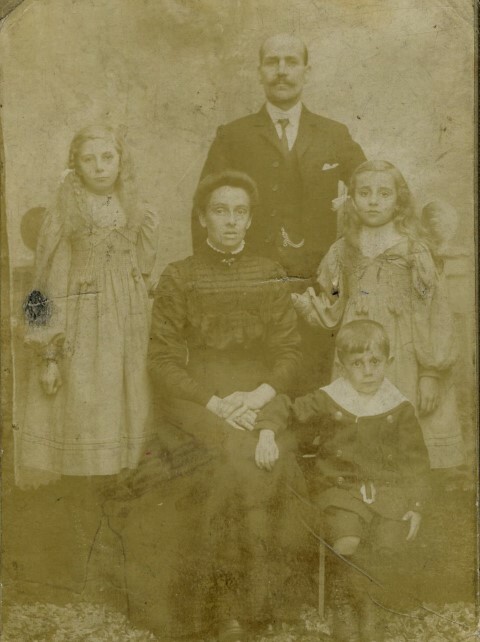 The 1901 census confirms that the Gray family were residents of Main Street, Cockfield, living next door to the “King’s Head” PH. William bc.1878 at Normanby near Middlesbrough worked as a coal miner and he married Mary Elizabeth Walton from Burnt Houses in 1898. By 1911, the family lived at 20 Evenwood Gate and William worked as a coal miner (hewer). John George bc. 1906 at Evenwood Gate. The exact date he moved into Evenwood is not known but must have moved from Cockfield between 1901 and 1906. In December 1912, William was elected to the position of checkweighman at Randolph Colliery. He was also a Parish Councillor. At the outbreak of war, he was Secretary of the Soldiers and Sailors Fund. The service details of 178943 Gunner William Gray and war diary of the 52nd Battery RFA have not been examined. He enlisted at Woolwich, Kent and served in the Army Veterinary Corps (regimental number SE/13879) then joined the Royal Field Artillery as a gunner. He entered France 21 December 1915. 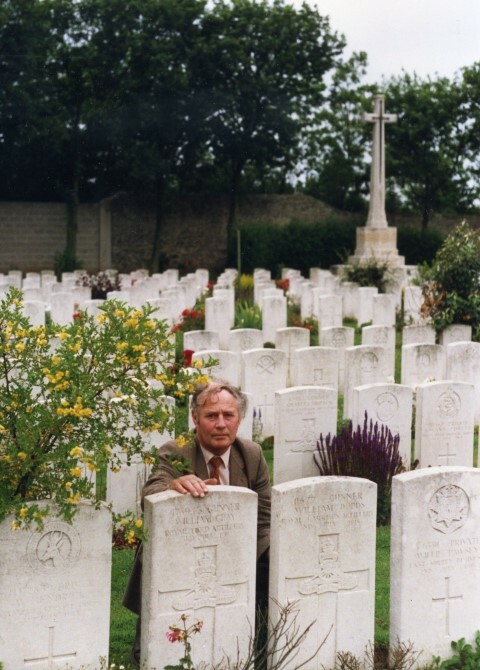 William Gray was 36 years old, married with 4 children when war broke out. He was a coal miner – a colliery checkweighman and there was no reason why he should have volunteered. He was in a “reserved occupation” but clearly his sense of duty moved him to volunteer for service. “I am now somewhere in France and am quite settled down to my new life. I only had a fortnight’s stay in England after joining my Corps before being sent out here and we arrived at this camp late on Xmas Eve. We had a glorious day on Xmas day and I thoroughly enjoyed myself. I have not yet seen any of the Evenwood lads here but I met Tom Etherington at Woolwich. So far I have had no occasion to regret joining the army and have the satisfaction of knowing that I am doing my bit for my country in a time of great stress. I was sorry I could not get into a fighting unit but though far away from that, we have plenty to do and any amount of risk to run amongst the horses. There are hundreds of them passing through this hospital every week. There are some vicious brutes amongst them and when they start their games and the fun is on and we have to be on the look out for mischief. I cannot tell you where I am stationed but the country is very beautiful round about. The camp is in a valley with large woods and hills around. The hospital and camp is not finished yet and at present we are living under canvas but when it is finished it will be a nice place and we will have huts to sleep in. I would like to thank Mrs. Collis for her offer of shirts and socks but I am not in need of this kind at present. Also I would like to thank both her and yourself for the kindly and courteous manner in which you always receive me. I shall always remember with pleasure the great help I received from Mrs. Collis in the work I was doing on behalf of the S. and S. Families Association. I have received through my wife, a very nice letter from Mrs. Hendy thanking me for the assistance I was able to render. Often at night I sit in camp, my thoughts turn to my associations with Evenwood. One thing I have noticed during my short period in the army is the great amount of good the Church Army, the Salvation Army and the Y.M.C.A. are doing by erecting halls at the various camps. That is one thing which this camp at present lacks but I hear that they are going to erect one shortly. As a result of a determined enemy offensive on the Italian Front and a defeat of Italian forces at Capretto, the British Government at the request of the Allied Supreme War Council, sent 5 British Divisions, including the Fifth, to Italy in an attempt to stiffen resistance. The Division was moved to the front line along the River Piave, taking up positions in late January 1918. “I am doing a little campaigning under the blue skies of Italy, the country of Garibaldi and Mazzini and speaking candidly, I am greatly pleased with the change from Flanders. Of all the infernos that were ever created, you beat everything. I had experiences and saw sights there which I shall never forget and the marvel is, not that so many were knocked out but that any of us remained. It has been well christened the “Flanders Ironfoundry”. It wasn’t so much the shelling we minded as the incessant bombing night and day with aeroplanes which caused most of the trouble. Besides this, except for the first day or two, we were up to our knees in mud for the two months we were in action there, yet everybody did their best to be cheerful and stick it out like heroes. We were very glad however when we turned our backs to it. The battery I am serving in now is one of the old units and has been in it since Mons and those of them who were left frankly avowed that this was the worst they had ever experienced. When we came out of action it soon became known that our destination was sunny Italy. We got into the train on Nov.28th and crossed the frontier on Dec. 1st. I never in all my life thought that there were such beautiful places in the world. Of course I only got a passing glimpse of them, yet from what I was able to see I felt that I would give a great deal to visit them at my leisure. I shall always remember my first day in Italy and the splendid reception we got. We crossed the frontier in the early morning just as the soon was rising over the blue Mediterranean. It was like a perfect mid-summer mourn in England. I was astonished to see roses, carnations and numerous other flowers blooming in plenty out there in the open gardens. Oranges in their thousands on the trees made your eyes dazzle as the train rushed along. At every place where we stopped at, the people literally smothered us with flowers and fruit and for two days we travelled with our train decked from end to end with roses etc. Altogether we were six days and nights on the train and no matter where we stopped, day or night, someone was always waiting with hot coffee and eatables. When we had left the train and started marching (we were in the fighting area now) on our way we passed hundreds of refugees, sad-faced and weary trudging along and pushing on barrows or whatever of their worldly goods they had been able to scrape together. These people, old and young, men and women and children had been driven from their homes by the fortune of war. It was a pitiable sight. 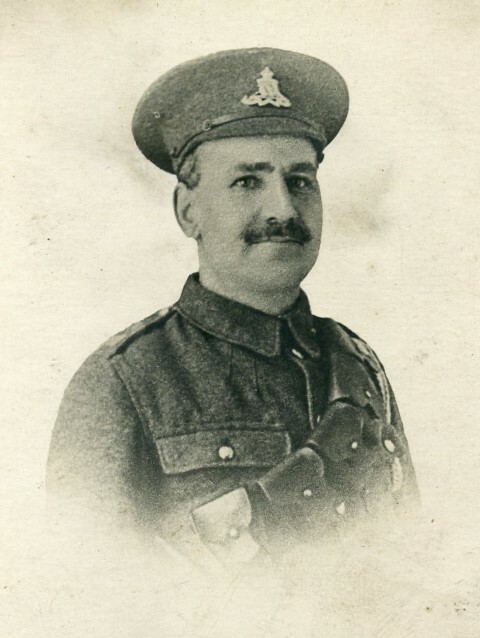 No.1 – a Sergeant (but could be a qualified Corporal) who was responsible for the gun and crew. He gave the fire orders received from the Command Post via roughly the bearing of the gun. No. 2 – sat aside the right hand seat dealt with the range wheel with his right hand and breach lever with his left. No. 3 – the Layer, sat on the left hand seat facing forward, set the sights to the bearing and elevation as ordered by the No. 1 and elevating wheel (also the traversing wheel on 18 pounders), controlled the hand brake and fired the gun when ordered. No. 4 – the Loader, stood on the left of the trail and loaded the rounds into the breach, responsible also for the Aiming Posts and Paralleloscope. No. 5 – the Ammo Number, was also responsible for the correcting bar. No. 6 – the Fuze Indicator, Nos. 5 & 6 stood behind the limber, set the fuses and passed the rounds to the No. 4 loader. Nos. 7, 8, & 9 – in action, would remain at the wagon lines to assist in the re-supply of ammunition and replace casualties. No. 10 – the Coverer, second in charge of the subsection and is in charge of the gun group ammunition wagon, in action remains at the wagon line in charge of the horse teams and wagons of his subsection. The 18 pound gun was pulled by a 6 horse team. It also had 1 carriage limber (ammo cart) which carried 24 rounds of ammunition and 1 ammunition wagon limber which carried 38 rounds giving a total of 62 rounds – this was the first line ammunition supply. The gun and each limber was pulled by a team of 6 horses, each team consisted of 2 leaders, 2 centres and 2 wheelers, when ridden the riders mounted on the left. Each gun detachment had 18 horses. 18 pound guns fired 3.3inch (84mm) calibre shells. They weighed 18.5 lb (8.4kg) each. A well trained crew could fire 30 rounds in a minute. 3 types shell were fired – high explosive, shrapnel and gas. R.F.A. batteries consisted of 6 no. 18 pounder guns to each battery named A, B & C. D battery was normally Howitzers. Gunner William Gray had experience with the Royal Army Veterinary Corps therefore it is possible that he was the Coverer and responsible for the horses. 3 March 1918: Soviet Russia made peace with Germany and her allies by virtue of the Treaty of Brest-Litovsk. As a result, Germany could now transfer troops from the Eastern Front to the Western Front. More importantly, these Divisions included the original elite of the German Army – the Guards, Jagers, Prussians, Swabians and the best of the Bavarians. In all, 192 Divisions could be deployed in the West. The Allies could field 178 Divisions. A single division numbered about 19,000 men so Ludendorff could call upon about 3,650,000 men as opposed to the Allies 3,380,000. Thus, the Germans now held superiority in numbers. The German High Command needed victory to be gained before the American Forces arrived in Europe in huge numbers. America had entered the war 6 April 1917 and in the July, the U.S. Commander –in – Chief Pershing asked for an army of 3 million men. The first of her troops arrived in France 26 June 1917. The training and build-up of troops obviously took time but eventually by June 1918, the Americans were receiving about 250,000 men a month in France. This amounted to 25 divisions in or behind the battle zone and another 55 in the United States ready to join the action. Elsewhere in the Alliance, the French were able to draw on a new annual class of conscripts after a year of inactivity but the British were worn down by continuous fighting during the summer of 1917 with major offensives at Arras, Messines, Passchendale and Cambrai. The strength of the British infantry had fallen from 754,000 in July 1917 to 543,000 in June 1918 producing a manpower crisis. 15 – 17 July: Operation Marne-Rheims, the final phase known as the Second Battle of the Marne. Between 21 March and 10 April the 3 main assaulting armies had lost 303,450 men – 1/5th of their original strength. The German High Command calculated that it required 200,000 replacements each month but only 300,000 recruits stood available taking into account the next annual class of 18-year olds. There were 70,000 convalescents available from hospitals each month but even counting them, the strength of the German Army had fallen from 5.1 million to 4.2 million men in the 6 months of the offensive. It could not be increased on the estimated scale required. To add to this dilemma, in June 1918, the first outbreak of “Spanish Flu” laid low nearly 500,000 German soldiers. This epidemic was to reoccur in the autumn and wreak havoc throughout Europe and the wider world. Added to this the poor diet of the German troops, battle fatigue, discontentment with the military leadership, social unrest at home and a general realisation that their great effort was beginning to wane, the Allies counter attack in mid July began to seize the initiative. Sweeping victories over demoralised German forces eventually led to the resignation of Ludendorff 27 October, the abdication of Kaiser Wilhelm II 9 November and the signing of the Armistice 11November 1918. Ludendorff’s first and biggest offensive had resulted in the greatest advance since the first months of the war but it had failed to achieve any decisive results. The chief error was that he had concentrated his efforts on the strongest sector held by the British Third Army and the operation was affected by severe transport problems and low morale of undernourished troops. Casualties were enormous – 240,000 Allied losses, slightly more German casualties. Unable to make further progress on the Somme, Ludendorff turned to Flanders and the Lys Offensive. The Battle of Lys, also known as the Fourth Battle of Ypres and the Battle of Estaires, was planned as Operation Georgette with the objective of capturing Ypres. In one of the greatest failures in the military history of Portugal, the Second Portuguese Division, approx. 20,000 men commanded by General Gomes da Costa lost about 300 officers and 7,000 men killed, wounded and prisoners, resisting the attack of 4 German Divisions with 50,000 men of the Sixth German Army commanded by General Ferdinand von Quast in the first day of the offensive. The 5th Division saw action at the Battle of Hazelbrouck, (the third phase) 12 – 15 April playing a part in the defence of Nieppe Forest. The offensive was abandoned 29 April when attempts to seize the Flanders heights ended in failure. The second German offensive had resulted in an advance of up to 10 miles but none of their strategic objectives had been achieved and the channel ports remained safe in Allied hands. The Germans had lost 350,000 men the Allies about 305,000, the great majority of them British since the beginning of the Spring Offensive. to push the British lines away from the edge of the wood where they had made an easy target for hostile artillery. It is assumed that the artillery positions held by the 52nd Battery were some way south of Aval Wood. Following the retreats of March and April, La Becque was one of the first successful operations when the Allied forces went on the offensive. No-one could have foreseen that the war would be over in 5 months! Chlorine gas – first used by the Germans 22 April 1915 at the Second Battle of Ypres against French and Algerian troops, a yellow green cloud drifted towards their positions. The effects of chlorine gas were severe. Within seconds of inhaling its vapour it destroyed the victim’s respiratory organs, bringing on choking attacks. Phosgene gas – as a weapon, it was more potent than chlorine. Phosgene caused much less coughing with the result that more of it was inhaled and had a delayed effect of up to 48 hours after inhalation. Mustard gas (or Yperite) – an almost odourless chemical, was distinguished by the serious blisters it caused both internally and externally, brought on several hours after exposure. Protection against mustard gas proved more difficult than either chlorine or phosgene gas. The use of mustard gas had mixed benefits – while inflicting serious injury upon the enemy, the chemical remained potent in soil for weeks after release making capture of infected trenches a dangerous undertaking. By 1918, the use of poison gasses had become widespread by all armies particularly on the Western Front. The German army ended the war as the heaviest user of gas. It is suggested that German use reached 68,000 tons and the British, 25,000. It has been estimated that among British forces the number of gas casualties from May 1915 amounted to some 9% of the total but of this total only about 3% were fatal. Even so gas casualties often led highly debilitating lives thereafter with many unable to seek employment once they were discharged from the army. There were 188,706 casualties of the British Empire forces from gas and 8,109 deaths. And flound’ring like a man in fire or lime..
Gunner William Gray was awarded the 1914-15 Star, the British and Victory Medals. He was the oldest Evenwood resident to be killed in the Great War. “…there is one thing that stands out in my memory and that is the Memorial Service which we had for the late Gunner William Gray. This was held on Sunday afternoon, July 21st at 3pm. There was a large attendance of relatives and friends and the service seemed to me a singularly impressive one. My address on the occasion was based on the text S. Matt. x 39, “He that loseth his life for my sake shall find it.” The text was taken from the 2nd Lesson appointed for that day and the words seemed to fit the occasion in a wonderful way. If anybody ever gave his life for a good cause for conscience sake, certainly William Gray did. He was in every sense a volunteer. I remember how he described it to me, the deep impression which had been made on him when he had seen some of the sufferers from the effects of the enemy’s poison gas. I believe it determined him to take his full part alongside those who were striving might and main against barbarity. It seems strange that he himself should eventually have been a victim to it. His letters home were impressive. I gave one here once, you will remember and it created very much interest. It was a phrase, however, in one of his letters home which gave me an insight into the real character of the man. It was in reply to the remark from one of his family of the loneliness of his usually cheerful little home without him. “I know that loneliness out here.” he said, “and I often feel it and the deep longing for you all, but I fight it down.” That was just his very self as you all know. He fought strenuously for his own side against all opposition in the smaller matters of our local lives. We did not all agree with him always but we all liked to have him with us if possible and not against us. He was the kind of soldier that nothing would stop from going right over the enemy’s parapet, except an over-whelming weight of sheer physical force, which in our homely language is sometimes called a “knock-out” should meet him on the way. But though these qualities are great, it is, I think, equally great if not greater, for a man to be able to fight down his own longings, his own desires, even his own affections in a great cause. Yes, William Gray was a Soldier, a Man and in my opinion a True Christian. The permanent headstone was erected in May 1922. In September 1918, Mrs. Gray was forwarded her husband’s possessions, disk, letters, photos, pipes, wallet, rosary, cards, knife, aluminium specs, case, medallion and souvenirs. Various sources including “First World War” Keegan J.